Pipelogix has celebrated 11 years in the industry. We are very proud of our product along with its growth and recognition in the marketplace; our dedicated staff that always puts the customer first; and what our company represents to its many customers. PIPELOGIX is the software of choice for ease of use, clarity, flexibility and informative reports. Because PipeLogix has always been an Asset Based Program, it easily interfaces with asset management programs since it utilizes unique mainline pipes, lateral pipes, and manholes within the program and tracks surveys done on them. The browser contains complete sort and query capabilities, allowing you to filter on entered information i.e. 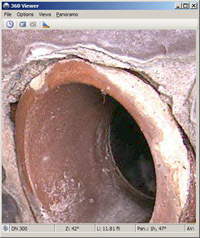 pipe size, location or defect. PipeLogix offers several modes including PACP and WRc. The core module contains a complete set of pipe defect codes so you are up and running in 15 minutes, producing professional reports and creating your own descriptions. PIPELOGIX software works the way you want—on site or back in the office. Database functions i.e. Backup, Filter, etc. 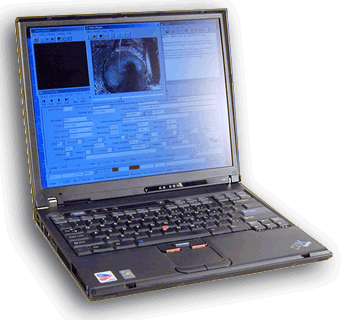 DVS (Digital Video Survey) Module provides an improved way of viewing and storing sewer surveys that are collected each year by cities and contractors. 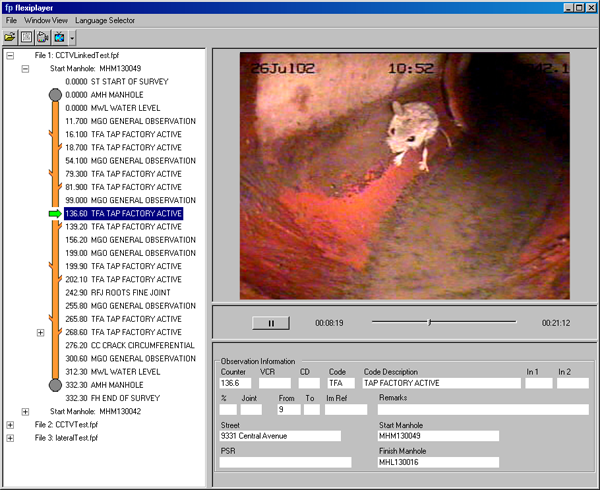 DVS records a digital file of the survey as an mpeg or wmv file as the CCTV Operator is entering the observations seen in the pipe using PIPELOGIX. DVSplayer is a great way to share information. Surveys are selected and exported quickly and easily with the built in CD/DVD burn function in PIPELOGIX. The disc created is auto loading, requiring no program installation by the user/viewer. View survey detail including header information, movie, pictures, and conditions. The tabular and Pipe Graphic reports are included as well as the Picture List (new with version 6.4.8). Lateral surveys done from the mainline are available as links off the mainline. The GIS module was developed to give the CCTV Operator a visual aid in selecting the pipe to survey. Since its release in 2004, new functionality has been added to assist the Supervisor. A Full Reporting license is required to import and export GIS information and perform other GIS management functions, but the map can be displayed with a Lite Reporting license in the survey form to select pipes for inspection. ArcGIS 10.2 through ArcGIS 9.3 are supported. 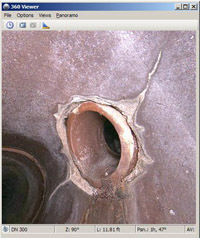 Manhole Module offers an in-depth survey format for the manhole and its components. Both the ASCE standard and the MACP standard can be used in conjunction with Full Reporting or Lite, or it can be used alone with the Video Capture or DVS modules. Both asset and survey forms are provided to collect and store information. MACP mode is available when PACP mode is selected in the project. It was released with Version 6.2.4 in August 2007 and certifed by NASSCO on September 19, 2007. It was certified to the latest Version 6.0 standard in March 2011 and now offers the new Level 1 and Level 2 Inspections. ASCE mode is available when Standard Mode or WRc mode is selected in the project form. The 360 Survey Module is designed to work with the new scanning cameras like Panoramo and Panoramo SI. When 360 is paired with a Lite Reporting License, it launches the Panoramo scanner and also creates Mini-movies. The IPF file is created and can be played back and reviewed. The powerful analysis tools built into 360 are combined with a Full Reporting License to create accurate survey data from three different pipe views. The Full View resembles the traditional survey movie with travel through the pipe controlled by your computer mouse. You can travel fast, slow, pan and tilt or zoom to problems. The Overview shows the entire length of the pipe as an unfolded segment. Measurement tools are provided to accurately measure cracks, intrusions, pipe diameter and even the water level. Log observations into the survey form; footage and clock reference are automatically entered. Take pictures or use the measuring tools; they both link directly back to the PIPELOGIX survey form (Version 6.2.9 or later required). The start and end of a continuous defect can be seen in the Overview layout. Log the start of the continuous defect and the End Continuous Defect button automatically enters the accurate ending footage. Re-occurring conditions like Tap Factory Active are automatically entered with the Repeat Observation Tool Button. When combined with a Manhole License, 360 can launch the Panoramo SI scanner to create the IPF file as well as create a manhole survey in MACP or ASCE format. All of the same capabilities you have with Full Reporting are available to you. 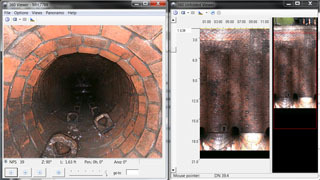 Export to the 360 Player to share survey data from either the Pipe or Manhole surveys. The MPEG 4 Module is available with Version 6.4.8 or newer. The Microsoft Windows 7 operating system is required to record and view the video. The Windows 7 standard decoders are used to playback the video file. Features include Stope and Pause. Append is not available with MPEG 4. A HASP dongle is required. If you have a parallel port, purple USB, or black USB key it will need to be returned to PipeLogix so you can be sent a HASP USB key with MPEG4 added to your other modules. PIPELOGIX is compatible with most asset management programs such as Cityworks, Infor Public Sector Hansen V8 and lucity, among others. PIPELOGIX has always been able to integrate with other software products through its comprehensive Import/Export formats. Custom imports or exports can also be created. Just contact us to discuss them. Version 6.4.8 includes the option to add an MPEG 4 Module. The DVS Module is a minimum requirement. PIPELOGIX Software works with Microsoft Windows 7 Professional (32 bit and 64 bit). Can the survey history for a selected asset be viewed? The asset form has a menu choice to view all associated surveys for the asset. All reports, pictures, and movies for all surveys done on the asset can be viewed by paging through the survey forms. Can asset detail be entered into a survey from a map or list? Asset detail can be imported into PIPELOGIX software from many different sources. If the GIS module is used, asset detail is imported from a shape file. During the CCTV inspection, the operator can call up the area map and select the pipe to inspect. This inserts the imported detail into the survey form saving the operator time and chance of error. The operator also has the choice of selecting the pipe from the Pipe List available in the survey tool bar. Can an asset exist in PIPELOGIX software without a survey associated with it? Because PIPELOGIX maintains separate asset tables from survey tables in the database, assets can be imported or entered into Pipelogix without doing a survey. Can a Master Database be created with information from several different trucks. The Full Reporting License has a copy and paste function that allows you to move data between databases. Projects or Surveys can be copied and pasted to a new database. This procedure renames the associated video files, so it is recommended that the File Naming function for pictures and video be used. Can assets be imported into PIPELOGIX software? Mainline, Lateral, and Manhole detail is stored in dedicated tables in the Microsoft Access database. That is why it has always been able to handle transfer of asset detail easily with other software products. The information is viewed in the asset form that can be accessed from the Browser Screen or the Survey Form. If you select to view a pipe from the browser screen, you can choose to view all surveys done on that asset. Is there an easy way to rename video files? With the PIPELOGIX software you can create a file naming template that will use information stored in the tables when naming your video file. For example you could have it named for the upstreamMH_downstreamMH_surveydate_consecutive letter. This will be done either as the file is created or when it is archived (removed) from the truck’s computer hard drive. It is your choice. How can a survey be moved to a different database? With a Full Reporting license, surveys can be moved between Projects or Databases with the Copy/Paste function. PIPELOGIX software has a built-in code editor that allows changes be made to existing codes or new codes are added. Certain modes restrict the editing of codes. PACP for example does not allow any changes to the codes other than the addition of inspectors to the Operator list. Can fields be made mandatory? A Full Reporting license is required so that there is access to the Administration Program. Once logged in as a Supervisor, fields can be made mandatory in the survey forms simply by right clicking on the field name and choosing mandatory. Can you view the database without a license? An installed copy of Version Six will open as a Reader if a dongle/license key is not on the computer. All survey information can be viewed or printed. Editing or creating new surveys will not be allowed. The database can be viewed from a network, hard drive, or CD.